Alex Merchant and Madeline Lagattuta walked through their recently purchased home in Polish Hill. Chalk marks covered the floors, indicating where new walls will be erected and bathrooms created. Right now, the 100-year-old house has been stripped back to its bones. It’s a blank canvas for all kinds of design opportunities, right down to the plumbing. “Our plan is to recycle the water from the washing machine, the showers and the bathroom sinks because that water is mostly, perfectly like normal water,” Merchant says. He was talking about gray water. It’s the wastewater that comes from just about everything in a home, except the toilet. LISTEN: Are Home Gray Water Systems Coming to Pittsburgh? Some large buildings in the city already capture gray water, filter it and then use it for flushing toilets. Alex and Madeline just want to use the gray water to irrigate a few trees and planter boxes in their backyard. Such systems are common in the West, where water is scarce, but it’s more uncommon in this region, especially in private homes. It’s so uncommon, in fact, that the plumbing codes regulating such systems in Allegheny County are vague at best. Health Department Director Karen Hacker said the department is considering updating its plumbing codes to create clear standards for water recycling systems. Without county regulations, most gray water recycling systems are do-it-yourself projects, according to Allegheny County Plumbing Program Manager Andy Grese. It’s a project that can have hazards, he said. The risk could come from a system that allows the gray water to back flow into the municipal water system. Simple check valves could prevent that, Grese said. The best gray water systems use non-standard size pipes that are colored purple, but DIY systems might not employ any safeguards, Grese added. “At some point, that home is going to get turned over to someone else, and if these safeguards aren’t put in at the time when this is all installed, the new homeowners aren’t going to know nothing about it,” Grese said. It’s possible that a new homeowner could install a refrigerator with an ice maker and unknowingly tap into a gray water system installed by the previous owner. The 2015 international plumbing code standardizes gray water systems, but the state and county are still using the 2009 code, which is mostly tacit on the issue. The expectation is that the county will use the 2015 code with a few exceptions and clarifications. County officials said they want to make sure that rain barrels, which collect water only to be used outside, aren’t made illegal. Any new code would go before the Plumbing Advisory Board for a vote, then to the County Board of Health and finally to the County Council. At each step, there would be an opportunity for public input. Ben Ledowitz with the Fourth River Workers Guild said he plans to be among those who will speak. The guild often works with property owners who are interested in sustainable or environmentally friendly projects. It has helped design some gray water systems, but Ledewitz didn’t specify if any are being used. 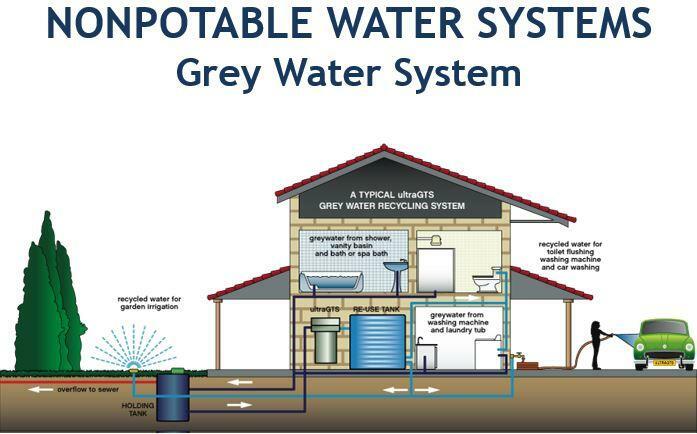 The positive impact from using an in-home gray water system could be substantial. Jim Kelly, deputy director of the health department’s Bureau of Environmental Health, said 20 to 30 percent of home water consumption could be recycled. That would lower water and sewage bills, reduce overall water consumption and help the region deal with its combined sewer overflow issues. “Of course, the interesting result of this could be that more people would be aware of these systems and they could actually increase the proliferation,” Kelly said. New training and testing for certified master plumbers would follow any new code. Kelly said it’s clear that more public education is needed. The health department’s plumbing board is expected to take up the code changes at its meeting next week.